The Leopard Gecko (Eublepharis macularius), a pet trade staple, is sometimes promoted as an easy-to-keep “starter-lizard” that requires little more than heat and some vitamin-powdered crickets. Those who follow this advice may keep their pet alive for a few years, and may even feel satisfied that they have provided it with a good life…similar to the mentality that doomed millions of Red-Eared Sliders to early deaths years ago. However, the Leopard Gecko’s captive lifespan should be measured in decades, not years – animals in their teens are common, and the record-breaker exceeds 30 years of age. Following are some tips to help you provide the best possible diet for your pet. In it’s native habitat (dry, rocky scrubland from NW India to Iraq), the Leopard Gecko consumes dozens of species of spiders, beetles, locusts, caterpillars, scorpions and other invertebrates, as well as the occasional lizard or nestling rodent. The key to keeping them healthy in captivity is dietary variety. Vitamin/mineral supplements are useful, but cannot take the place of a variety of well-fed invertebrates. The Leopard Gecko is native to places where food availability varies widely, and it therefore processes and stores food effectively. This is a good survival strategy, but leaves them prone to obesity in captivity. Non-breeding adults in good weight require about 9 insects weekly (you’ll need to experiment a bit here, and females held for breeding should have ample fat deposits). Their food should be divided into 3 weekly meals or more frequent but smaller offerings. Newly-hatched geckos can be fed daily, with meal frequency being decreased to every other day or so as they reach 1 year of age. While Leopard Geckos are relatively easy to keep (as lizards go), potential owners should understand that collecting, breeding or otherwise obtaining a proper diet takes time and effort – often as much as is required by all other aspects of the lizard’s care! The main portion of their diet should not be crickets, but rather a well-balanced mix of roaches, crickets, mealworm beetles, sow bugs, butter worms, waxworms, wild-caught insects, silkworms and tomato hornworms (these last 2 available via internet dealers). I use super mealworms sparingly, and then only newly-molted (white) grubs. Insects offered to your pets should themselves be well-fed (please see articles below). Adult geckos that are fed a varied diet require a vitamin/mineral supplement (Reptivite w/D3 works well http://www.thatpetplace.com/pet/prod/239543/product.web) once weekly. Growing youngsters have higher nutritional requirements…their diets should be supplemented 3-4 times weekly. Leopard Geckos are usually enthusiastic feeders, and take readily to tong or even hand feeding. Canned Grasshoppers and Silkworms should be used to increase dietary variety. Canned insects can also be rolled in Zoo Med’s Dried Flies to improve their nutritional value. Next time we’ll cover 2 important Leopard Gecko “Do’s and Dont’s”: wild-caught insects and mice. A video of a Leopard Gecko eagerly but gently feeding from the hand is posted here. An interesting report on Leopard Gecko natural history/feeding behavior is posted here. Tomato hornworms and silkworms are noted as good gecko food. Are other catapillars usually OK to eat as well? My son and I are trying to find some feeding alternatives that we can catch instead of buying at the pet shop. It’s more fun too. Hello Jeff, Frank Indiviglio here. Thanks for your interest in our blog. It is a great deal of fun, and very interesting to collect. Caterpillars can be a bit tricky, as many absorb plant toxins and use these as a defense…avoid brightly-colored species as well as those with hairs. “Inchworms” and other smooth, usually green or brown types are fine, assuming they are collected from pesticide free areas. Sowbugs are excellent, as are most moths, beetle grubs, field crickets, grasshoppers, tree crickets, earwigs…please check this article on sowbugs for more info, and this series on Collecting Insects for further info, and be sure to write back with any questions. Is there any bugs to feed to him during winter????? I would like to find out!!! Thanks for your interest. It’s harder to collect bugs in winter in most places, so it’s worthwhile to search for dealers who can mail insects to you. In addition to crickets and waxworms, live sowbugs (pillbugs), calciworms, butterworms, silkworms and roaches are usually available. Mealworms are ok occasionally, but best to start a colony and feed only newly-molted (white) mealworms (see article below). Another option is to offer canned insects via feeding tongs. Grasshoppers and silkworms will provide some useful variety…canned grasshoppers are usually large, so you may need to break them. I just wanted to let you know that your articles continue to inspire lizard owners to branch out. I recently took in a leopard gecko in need of some rehabilitation, and scanning GeckoForums.net led me to your blog. This article, as well as many others you have written pertaining to feeding insects, has motivated me to explore more options rather than settle for the boxed crickets at the local chain store. I’m currently enjoying raising silkworms from eggs (they are about to enter the fifth instar), and I plan to order my first roaches soon. I did not have much luck maintaining my own cricket colony; I believe the humidity in my area is too high to have the crickets in a plastic enclosure and contributed to some mass die-offs my colony suffered. I hope that roaches will prove more suitable to my climate and that I might maintain a breeding colony. My blue tongue skink is also enjoying the spoils of my new-found feeding knowledge. His dietary protein was previously given in the form of canned dog food and cooked chicken; he has been extremely excited by the silkworms. Thanks for the wonderful information, and I will continue to follow your blog in the future! Thanks very much for the kind words and interesting comment much appreciated. Humidity does contribute to losses. the containers described here worked in a humid location at the Bx Zoo; breeding/rearing is very labor intensive, however, and usually not worthwhile. The info in this article on chameleon diets is largely applicable to other lizards as well. I recently became mom to a house gecko who I’ve managed to keep alive for over a month now. Although I have lots of experience with other animals, reptiles are foreign to me so I’ve been reading as much as I can about these little creatures. My little one is a tiny wisp of a creature who I have currently have housed in the large size plastic terrarium with the vented lid, forest floor substrate, 2 artificial leafy plants and a half log hideaway. I mist twice daily for water because I’m afraid he’d drown in a water dish. My biggest challenges are food & light. I don’t know if any type or strength of light would work with a plastic terrarium since there’s really no where to put a light on this type of enclosure. As for food, I’ve been feeding calcium dusted mini mealworms & crickets, for which I try to get the smallest ones I can which are still to big for his tiny mouth. I’m hesitant to order pinheads by mail because the smallest quantity I can get is 250 and they’d probably grow into adults before I could feed them all. It’s hard to tell if he’s eating the mealworms as some escape into the bedding, but he wouldn’t be alive if he wasn’t eating something. I’m getting an ExoTerra small habitat so I can provide light and would like to know if you could tell me if a compact flourescent for day and a blue moonlight bulb would be appropriate and if so, what wattage is appropriate, and what would be best foods for him since he has such a tiny mouth. I really want to do right by this little creature but I’m on pins and needles every day because I don’t feel like I’m doing all I can. Hope you can help, please and thank you. Glad to see your concern…most people do not bother with these little guys, but they are very interesting. There’s many species, most in the genus Sphaerodactylus, but the care of all is similar. Is this the terrarium, or the size terrarium, you have in mind?…if not please let me know the appx size. Also, please let me know the average temperatures in the room (w/o a light, as the tank is now). Most house gecko species are nocturnal, and do not need UVB exposure. It can’t hurt, assuming they have a hiding spot also, but they obtain D3 from food if the diet is adequate. They are tough to feed, as you noticed. mealworms should not be used…poor nutrition, associated with intestinal blockages. 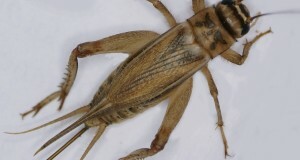 Pinhead crickets take quite awhile to mature, esp. if kept at normal room temps; some stores sell 1/4 inch crickets, which should also work. You can also order online, or sometimes buy in stores, flightless fruit fly cultures and flour beetle cultures; both will be accepted, but should be alternated with crickets and other foods if possible. If you are somewhere warm, collecting is often the easiest way to feed house geckos (“easy” being relative, of course! )…please see this article for some ides, and for more on flour beetles, fruit flies. Best to powder all meals with Calcium and a Vitamin/mineral supplement (the 2 linked are my favorites, can be ordered and also carried by many stores). Thanks so much for the info. Yes, that is exactly the terrarium I’m considering primarily because it comes with the lighting unit, most other smaller habitats I looked at do not and most lighting units seem to be sized for larger habitats, plus it’s fairly compact space-wise but should be plenty big enough considering how tiny he is. The pictures I found on the internet of hemidactylus frenatus look exactly like my little one. I live in central Florida. The room he’s currently in averages about 72-74 degrees day/68-70 at night, but often feels cooler especially when we get those “cold” Florida nights when it goes below 60. It also is not very bright in the daytime so I need to movie him to a brighter room as well. I was going to get a heat rock until I read that they can cause burns. I feel terrible now about feeding the mealworms and will make the effort to get the smallest crickets I can. I actually did find and try a jar of the fruit flies but didn’t dust them because I couldn’t figure out how without them flying off – which was amusing because the jar said flightless, but they seemed to fly, or at least hop. Plus they kept escaping out of the vents on top of the current habitat until I got a piece fine netting to put between the tank and the lid, and still do when I have to take the top off to get inside, so I think the Exo Terra tank will be able to keep more of the food from escaping. I’ll get another jar and will read about the flour beetles (hope they’re small enough to fit in his mouth) and the other articles you referenced because I really am in a panic about what kinds of food he can handle because of his size. Thanks again. That species and some relatives are established there; best to raise temps a bit if possible…dip at night should be fine, as long a s animal warms up in the day. I checked product specs…that terrarium accepts 3 types of compact fluorescent…the 5.0 would be best for your purposes. The 2.0 is recommended for nocturnal animals, but the gecko will be hiding for much of the day; over-exposure not a problem for them. I’m not sure how warm it will make the terrarium, however,…they do not give off much heat, but it is a small space lizard is more active at night, you may need a night bulb also, but fine to try daytime alone first. I just wanted to thank you for your wonderful blog! I have been researching leopard geckos and have finally decided on a breeder and my new boy is coming next week! I have never had a reptile before, only mammals, and have enjoyed learning all the fascinating things about them and their care. My main issue is the information on the internet about their diet. As a prey-model raw feeder for my 2 cats and 2 dogs, something just didn’t sit well with a mealworm only diet with occasional crickets. I went in search of a more natural diet that led me here. I have discovered so many opportunities to raise and collect food for my new family member than I ever thought possible! My eyes have been opened and I am so excited to start offering some mental stimulation for my little guy (he’s been on mealworms only). I was curious about one thing though and hoped you could offer some insight. My little guy is barely 5 mos old, so about how many insects should he be eating per week (I assume every other day feeding since he’s not a hatchling?) and how many different species? Is there any recommendations such as “(species of insect) should not make up more than X% of the diet” due to it being high in certain minerals/vitamins/fat? I plan to do mealworms, crickets, silkworms (when in season), dubia roaches, sow bugs, the occasional daddy longleg as I find them, small grasshoppers, houseflies if I can get a culture from a lab, and miscellaneous random insects that really won’t be considered a staple. I do not plan to feed waxworms or pinky mice. Thank you for any advice! Thanks for the kind words and the great questions..others will benefit also. Exact amounts per feeding are hard to set as individual genetics, type of food, temperature, etc. But geckos can adjust their metabolisms, within reason, to food availability, so no need to be too specific (adults can become obese easily, however). Please see this article for more detail on diet The general rule there I noted there: healthy, non-breeding adults kept at proper temperatures do well on 7-10 average-sized (approximately ½ the width and ¾ the length of your gecko’s head) insects weekly – can be used for juveniles; if yours seems hungry….wandering etc and not obese, you can up it a bit. Mealworms can be dropped, or you can keep a small colony and use only newly molted grubs or the pupa. Roaches are very good as a basis of the diet, well-fed crickets can be used regularly (stick to smaller crickets), sowbugs excellent if accepted, as are houseflies. Great that you are planning ahead…many do not! Thank you for the links! I somehow overlooked the mealworm one! I do have mine on an oat/ground Fromm Gold Puppy food mixture with sweet potatoes and carrots for moisture. Unfortunately I bought 500 thinking half would be dead when I got home. Well all but about 10 are active, eating and getting fat and healthy so now I have several hundred mealies. I will use them as a temporary staple since my little guy is only used to that. I will start my culture of pill bugs as soon as I can. I have come across some conflicting information regarding tomato/tobacco hornworms (is there really a huge difference between them when feeding reptiles?). My parents have a garden that they don’t spray (we try to hand pick insects) that I would love to harvest from. However, I have read on reptile sites that the wild worms are toxic, due to eating the leaves/stems of the tomato and various nightshade plants. On chicken forums it seems the birds will eat tomato plants with no ill effect and most love the worms as well. For a small reptile I understand size difference may be the deciding factor in toxicity but I wanted to ask where you have gotten hornworms from that were fed to the various reptiles you have/had under your care? There is also conflicting information about fat content. Are they similar to waxworms or lower in fat and very healthy like silks? Any insight is greatly appreciated! Thank you so much! You should have plenty of newly-molted mealworms to use..they are white in color, and a fine as a food source, just not as a steady diet. Beetles can also be used…some lizards will reject them, others eat readily. So my little (big) leo has arrived and is eating like a hog. We tried crickets for the first time 2 days ago and he ate 5 smalls and 6 last night. He seems to accept new food willingly and is quite the hunter! Back to a question on the hornworms (sorry!) So I have been researching if harvesting wild worms and feeding them a commercial diet or diet of tomatos/mulberry leaves/green peppers for a few days to a week would be doable. The only thing I have found is a website about cooking them for humans that recommends starving them for a few days or feeding vegetables not the stems/leaves from the tomato plant to rid them of any toxic frass. I cannot seem to find anything about the longevity of the toxins in their systems (ie does is stay present in tissues or once the food source is eliminated does it pass thru). I prefer not to buy any because they are a bit expensive with shipping, and I do not want to feed more than 2-3 a week because they are a larger worm. Can you offer any insight into this topic or should I just err on the side of caution and feed no wild caught hornworms? It’s such a shame cause they are rampant in my parents garden every year! Hi Frank! You mentioned feeding your gecko some wild-caught insects. My gecko just turned 1 year old last week. I’ve been feeding him mostly waxworms, superworms, mealworms, and the occasional cricket. He’s a solid 10″ long right now, so I thought I’ve been feeding him correctly. But, I was advised to not feed wild-caught insects from your backyard as they may contain parasites or harsh chemicals that were put into the environment. Is this true? Or, should it be okay to feed him a caterpillar or something from the outdoors? Thanks! W/C insects are very useful, but you’ll need to be able to recognize potentially toxic species and to be aware of the possibilities of pesticide contamination; parasites are less of a problem, as most are host-specific. Please see this article for more info. I have a 2 year old leopard gecko and she will only eat crickets (bought her at a pet store when she was 3 months old and they only fed them crickets). Once in a while she will eat phoenix worms, & wax worms and crickets, but completely refuse mealworms or other bugs from the bug farm. I am going to purchase from Georgia crickets, they are located at 749 W Winder Industrial Park, Winder, GA 30680. I live in the California high desert area, and my son recently found a leopard gecko in our garage. I have wondered if she might be some type of peninsular banded gecko, but our vet said she is too big, most likely a leopard. Anyways, She was thin and dried out and dusty when we found her, very cranky, I expected her to die. Its been a couple of months and she has perked up and become a very docile pet, and I swear she prefers to spend her time perched on my son while he plays xbox and watches tv. Larry (so named prior to discovering she was female) started in a 10 gallon tank on calcium sand with a basking lamp in one corner has been upgraded to a 20 gallon with a repti mat and hiding places, day and night lamps, a shedding cave, and a variety vitamin sprinkled bugs to eat. My son has developed an entirely new hobby of hunting and collecting nasty bugs and things for her. I am enquiring specifically about diet and weight here. She is an avid feeder and gets a couple of bugs every other day, but will eat up to 8 wax worms at a time if offered. 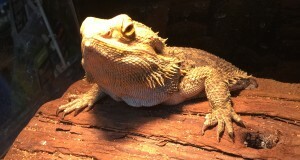 What is fat for a lizard? Her skin is velvety and nice, her eyes are bright and she is alert, her shedding came off in one big peel that looked like a perfect gecko when we shook it out. Her tail has a little squishiness to it, but I’m wondering what I should be looking for as far as her being overweight. Oh, she’s approx. 8 1/2 inches nose to tail tip. I don’t see how to include a photo of Larry. Thank you in advance for your time, it’s been a lot of fun reading your posts and learning more about our little foundling gecko! Someone recently asked about feeding mantids on the Gecko Nation group. There doesn’t seem to be a lot of good information on the internet about using young mantids as feeders for geckos, and many people wonder if it is dangerous. Can you provide any information from your experiences? Is there anyway to figure out how old my leopard gecko is? i have had her for eight or nine years but i am her third owner. i just thought it would be cool to know. thanks for any help! Hi Frank! My sister bought a leopard gecko about 2 years ago and after awhile she decided to give her to me. When I went out of town for about 2 months I left my gecko in my sister’s care. She forgot to feed her often and I think she only fed her 2 times while I was gone. When I came back my gecko’s tail was very tiny (I think this is where they store food) when I left it was a good size. My gecko was also very skinny when I came back. I was wondering how I could get her back to a healthy size. Also when I was going through my pantry I found mealworms in the oatmeal. I was wondering if these would be ok to feed her. Also can I feed her crickets that I find in y backyard? I purchase crickets, mealworms, and many other varieties of insects. Thank you for your help! Hello Frank, I am a happy owner of two female 8-year-old Leopard Geckos. I simply wanted to thank you for informing us owners to add variety to our gecko’s diet for longevity. For all the time I’ve owned the geckos I’ve only fed them a limited diet of supplement dusted crickets and rarely some mealworms if I felt brave. Anyway we should be seeking advice from you about our detailed care for our geckos. The unfortunate outcome of me listening to an inexperienced pet store employee was when I adopted a new juvenile leopard gecko that was very small. I asked the employee if I could group the newcomer with the adult. And Susan, one of my adult leopard geckos ate her. The only way I knew was that the enclosure was completely secured she had no way to escape and this habitat was just for the new one and Susan. The other adult female was separated in another tank for grouping troubles as well! Females are sometimes aggressive too:(! !